Heavenly Homestead | a simple site to showcase some of our adventures in homesteading, Crafting and life. Before I start, I must say that I’m alright… alright in the sense that I’m better than 6 months ago. Until now, I’ve been pure ashamed and embarrassed to come right out and say, “My husband left us for another woman.” I’m sure this happens more than we wish to think and I know I’m not the only one in this same struggle right now. It just doesn’t seem fair that he gets to move her into his bed (at his mother’s home, at that) and gets to be happy with that while I’m here in an almost empty home with our two-and-a-half year old daughter. As much as I begged and pleaded with him in the beginning of the end to stay to work it out and pave a path to forgiveness, he was just not willing. He gave me reasons such as I was a lazy woman, that I didn’t keep a spotless house, that I never wanted to go out and do anything, that I refused to learn to drive his manual transmission Jeep, and that he hated coming home and having responsibilities. While I don’t claim that he is entirely at fault for the failure of our relationship, there were choices made on his end that just didn’t have to happen. So, now I lay in bed alone most nights and think about what in the world is so wrong with me to cause this. I know good and well that there was nothing about me that made him go out and find another woman, but that doesn’t stop your brain from thinking in circles. Maybe if I had done this or hadn’t done that… just maybe… then you realize there was nothing you could have done differently. He meet her, fell into temptation (with at least once being in our own bed), and enjoyed it so much he decided to leave a loyal and devoted family to be with her. All the sneaking around, the leaving for work early and getting home really late from work, mystery food purchases at sit-down restaurants, explosive arguments over nothing, sudden attention to personal hygiene, going to the bar to drink socially with co-workers, some nights not coming home at all… all started to make sense once he finally admitted having an affair. It was like a burning, ripping fire that consumed my heart once he finally came out and said it. There’s nothing to describe it. You literally can’t breathe, you can’t even cry, your body just automatically implodes upon itself and you ball up on the floor as he stands over you emotionless… you’re in complete shock even though you had suspicion. That woman’s intuition. And then as the days go by, the questions come. And you try super hard not to start to hate love. You fall on your face to pray at the church altar, in the shower, in the truck driving some place, even in your Grandpa Bill’s callused hands and just can’t even find the words to pray. Then comes Valentine’s Day and you get flowers. What an insult. Then, just 3 days later, a notification of a civil suit for division of assets for separation and divorce. Restraining Orders, Domestic Violence issues, Court, lawyers. Then, also child custody issues. Who gets her what days and at what time and where to meet to exchange the child like she’s a possession instead of a person. You worry that this other woman is teaching her to call her “mama” when the child is with them, along with a long list of other concerns. Such as, what if your child gets attached to this woman and then she leaves? Don’t get me wrong, I’m so over this man. I was betrayed by him and his family, who I believe knew about her well before I did and didn’t bother to tell me. And he’s still wearing his wedding band and making people believe that I’m the reason why he left. I’m not a bitter woman, really I’m not. Just very, very hurt. 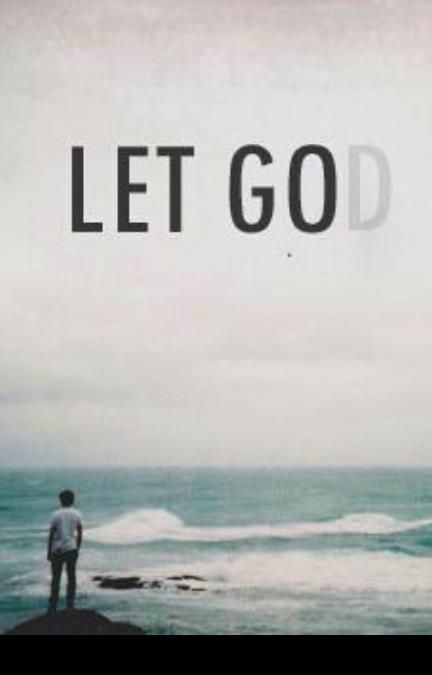 Especially when he was your first and only love. I don’t hate him either, but boy have I learned from this. When I look at his face, I feel nothing. He’s a complete stranger to me. THANK YOU, LORD for this experience. I praise You because You know the plans you have for me and my daughter. I thank you for your loving hand on our situation. Dear Father, today was one of those days – You know the ones. When life just doesn’t make sense. When the world seems so unfair. I need you, I need you. I need you to wrap your arms around me and help me understand that it is a good thing that I don’t understand everything. How can my human mind possibly comprehend Your perfect plan? You are God. I am not. You spoke this world into existence and shaped humans from the dust. Only you can create beauty from the ashes. Prepare me to be a Godly wife to the person you have just for me. Help me anticipate the perfect work of Your hands to transform my nothing into Your everything. Amen. Is he a “Christian Guy” or a “Man of God”? Is there a difference? I believe so… I know so. As a matter of fact, there’s a huge difference. A Christian Guy will say he loves you, but a Man of God will love God more than you. A Christian Guy will text you meaningful Bible verses, send you inspirational quotes on Facebook, or have a tattoo of scripture or a cross, but Man of God will live out those verses and have them written on his heart. A Christian Guy may attend church, but a Man of God will see it as his highest calling to serve Christ and give Him glory. A Christian Guy may accidentally-on-purpose compromise your virtue as a lady, but a Man of God will protect it above all else. A Christian Guy may be really attractive and say all the right things, but a Man of God will have a beautiful heart regardless of his appearance. A Christian Guy may talk to several ladies at the same time, but a Man of God is faithful and will cherish and respect you. 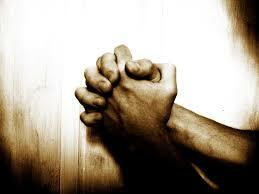 A Christian Guy may take you out, but a Man of God will hold you up in his prayers. And long to be the Woman of God, after God’s own heart, who will attract a Man of God… the one God created just for you. When working with crochet stitches, the little slip stitch tends to get many of us crafters in a tizzy. It’s just a tiny place marker stitch of little significance, right? It’s not the most impressive, outstandingly beautiful, or most impressive stitch to learn to create, but it has great significance. With a loop on your hook, insert your hook into the next stitch, pull up a loop, and then pull the yarn through the loop on your hook. Little sl st created. If this stitch is so small, why even use it? Why do you need it at all? 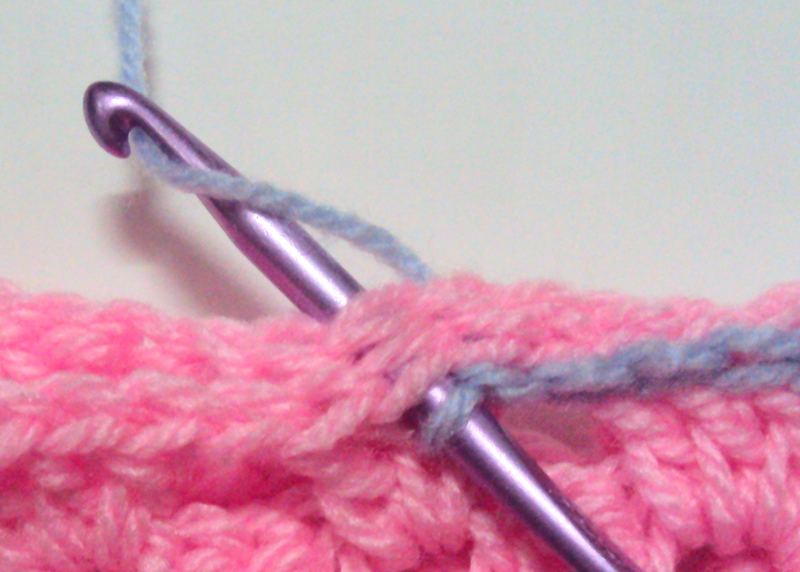 Why not use a fancier stitch like a double crochet or even, oh, the popcorn stitch? Well, even though they are tiny and don’t seem to serve much of a purpose upon first observation, they are rather versatile little guys. As I mentioned previously, the main objective to using a sl st is to join one side of your work to another. Think of it as a little bridge. Without it, the two sides of your work just don’t go together and you’ll be left with an unattractive hole in your work. Slip stitches can also be used to “sew” several pieces of work together, such as squares to make up a small baby blanket right on up to a King bed size afghan. Without the humble sl st, the pieces would just be small squares that wouldn’t be a very much use nor would they keep you very warm. The most impressive, yet still humble, use for the sl st is as a design element. Since a sl st is the smallest stitch used, it lets the larger, more extravagant stitches shine. With the sl st nestled between the fancy stitches, it is not as likely to be noticed in comparison to the other stitches unless you look closely. You may have to even pull the other stitches apart to find the sl st happily hiding in the shadows. The last project I completed required a lot of slip stitches. As I was working on this particular piece, I was reminded of the Biblical story of David and Goliath. The account of the great battle between the Israelites and the Philistines can be found in 1 Samuel, Chapter 17. The Philistines were proud of their giant warrior, Goliath, which the Bible describes as being “six cubits and a span” tall with “bronze helmet on his head and wore a coat of scale armor of bronze weighing five thousand shekels; on his legs he wore bronze greaves, and a bronze javelin was slung on his back. His spear shaft was like a weaver’s rod, and its iron point weighed six hundred shekels.” Goliath was an impressive chunk of man flesh standing approximately 9 foot tall, clad in heavy armor that weighed about 175 pounds combined, and with an arrogant attitude… and the Israelites were terrified. Goliath demanded that the Israelites choose just one man to fight him. “If he is able to fight and kill me, we will become your subjects; but if I overcome him and kill him, you will become our subjects and serve us,” Goliath shouted. This went on for 40 long days and nights. Goliath was just too big, too impressive, too strong. Whoa! Hold the phone, David! This giant Goliath has been trained to be a warrior since he was young. David, you are just a young boy! Imagine that kind of faith. Saul felt it, too. He helped David prepare for battle by dressing him in a typical battle attire – a suit of armor, a bronze helmet, and a heavy sword. The armor was so heavy, that David couldn’t walk around in the armor. Instead, he took it all off and asked for 5 smooth stones from the river. David ran towards Goliath, taking a stone, placing it into his sling, and let it fly. Could you imagine the breathless moments as the stone flew through the air and them landed with a thud into Goliath’s giant forehead… and then as 9 foot tall Goliath fell face first into the dusty ground. Goliath was an impressive beast. David, the slip stitch. There are so many lessons to be learned from this story, but the one I want to make is that no matter how insignificant or lowly you seem and feel, just remember the little slip stitch and David. You don’t have to be a fancy stitch, just a faithful small stitch will do. I could not get the yarn to cooperate and after several failed attempts, I threw the yarn and crochet hook down and walked away. But, I was determined… after watching some youtube videos (and backing them up and watching them again… and again…) I successfully completed my first basic granny square. My stitches were clumsy and too tight in some places and too loose in others. I had trouble finding where to put the hook for the next stitch. But, you know what? I didn’t give up. Not even after being discouraged about my work not looking perfect… and definitely not like the work in the picture of the pattern. So in the evenings after my daughter is snuggled into her bed, I pick up some yarn and my crochet hook and sit on the couch with a mug of herbal tea, with the glow of a candle flickering on the table. After a row or two of counting and getting into the rhythm, I converse with God. Sometimes I tend to be my worst critic and beat myself up. Sometimes things just don’t seem to be working out very well. Sometimes I get frustrated, doubt myself and sometimes I feel throwing in the towel on things more often than I should. I think that I’m not a good enough Mom, that I could put forth more effort at work, that I don’t read my Bible enough or pray enough. I think that I’m a really crappy friend and I’m not a very good example as an older sister to my sister and brother. That there’s something about me that caused my husband to not want to be married to me anymore. That my house is not sparkling clean and things are falling apart. I have thought about it all in some form or another as I sit alone with my crochet. Sitting in the (almost) silence, with the clock ticking, the hum of the refrigerator, or the puppy crunching happily on her food, the soft glow of my candle… I enjoy the pull and feel of the yarn between my fingers. The pattern nestled in my lap as I read it line by line and end up with a finished hat or a scarf or a baby blanket that will be enjoyed and used – the culmination of my talents. Sometimes I mess up and realize much later and have to rip out several rows and redo my work. Sometimes the size just doesn’t turn right or I accidentally use the wrong type of yarn or the wrong size hook and I have to start all over from scratch with fresh “string” and a fresh outlook. But, no matter how the stitches look or how the finished product turns out, I would be proud of my finished accomplishment and I would love it. When I started out crocheting, I had no idea that I would learn more than just how to make a starting chain, triple crochets, or slip stitches, but I ended up learning so much more. Yes, I mess up. Yes, things are not going to turn out exactly the way I think they should. Yes, I’m going to have to start from scratch on occasion. 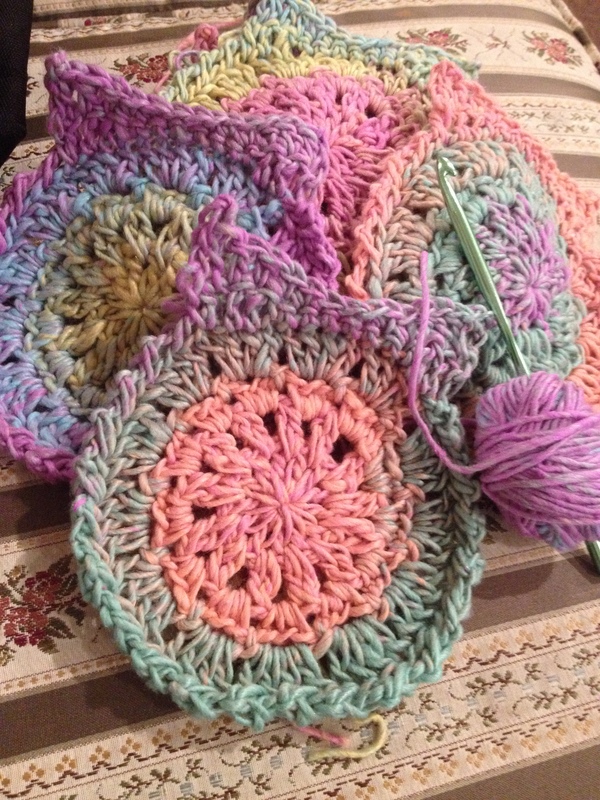 A lot of my crochet mistakes could be prevented if I had just read and followed the pattern instead of just telling myself, “You’ve got this… keep going and it will be just fine.” It got me thinking that the ultimate pattern I should follow for this life is the Word of God, the Bible. It’s the ultimate instruction book. Does that mean I’m still not going to screw up and repent? Nope. But, it does offer love and and hope and forgiveness and so much more for my screw ups. 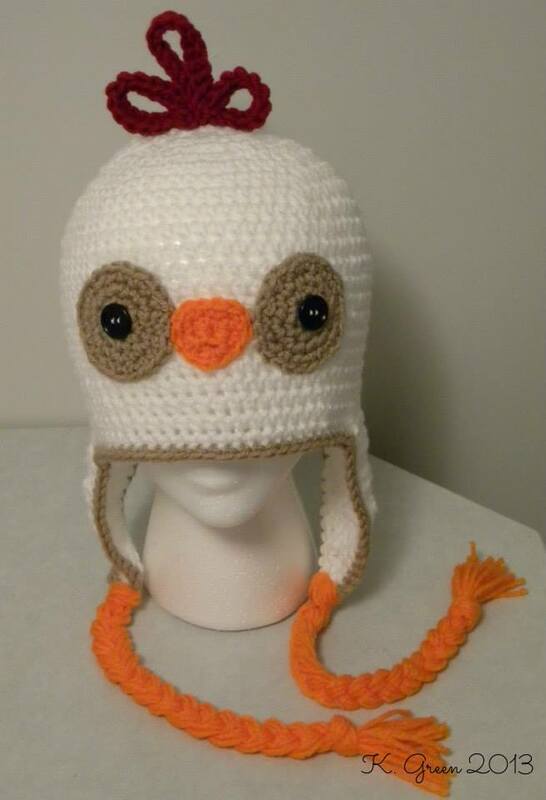 Recently I had a request for a chicken earflap hat and I didn’t have a pattern exactly how I imagined the hat to look. I used a free basic earflap hat pattern from Micah Makes, which you can find here. I omitted the color changes for the stripes and added another row of sc around the edge of the hat in tan yarn. Row 1: sc 6 into a Magic Circle, pull tight and join with sl st in first sc. Row 2: Ch 1, 2 sc into each sc around, join with sl st in first sc. Row 3: Ch 1, *2 sc in next st, sc in next st. Repeat from * around. Join with sl st in first sc. Row 4: Ch 1, sc in the first 2 st, 2 sc in next st. Repeat from * around. Join with sl st in first sc. Fasten off yarn and leave a long tail for sewing to the hat. Pin the eyes to the hat, stitch into place using yarn tail. Then, sew the black button securely to the center of each eye for the pupil. Row 1: Ch 5, sc in second ch from the hook and across to end. Row 2: Ch 1, turn, sc2tog twice. Row 3: Ch 1, turn, sc2tog. Row 4: Ch 1, sc evenly around the beak. Fasten off yarn and leave a long tail for sewing onto the hat. Sew the beak between the eyes using the tail of yarn. Ch 51, sc in 2nd ch from the hook and across to the end of the ch. Fasten off and leave a long tail. Fold the strip into three portions (see picture for folding suggestion) and sew together at the bottom to hold it in place. Then, sew the comb onto the top of the hat. For braided ties, cut 18 lengths of pumpkin orange yarn 36″ long. Use 9 lengths of yarn for each tie. See this tutorial on how to make the braided ties for your hat by Dearest Debi. 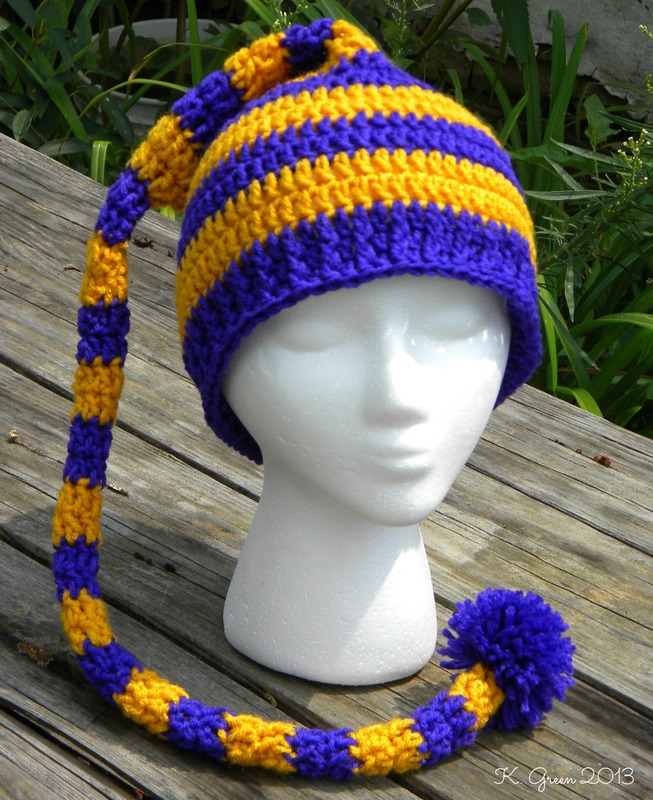 There are lots of smaller sizes of crochet long-tail elf hats floating around the web, but not very many adult size. Here is one that I worked up that will fit an adult head 22-24″. This pattern is written in US terms. This hat works up nicer if you know how to do the Magic Circle technique and how to change colors in the last stitch of the previous color row. Enjoy! 1:Using a Magic Circle, ch 2 and dc 6 into the circle. Join at the top of the first dc. Pull tight to close. 2 – 32: Ch 2, dc 6 around, join at the top of the first dc. 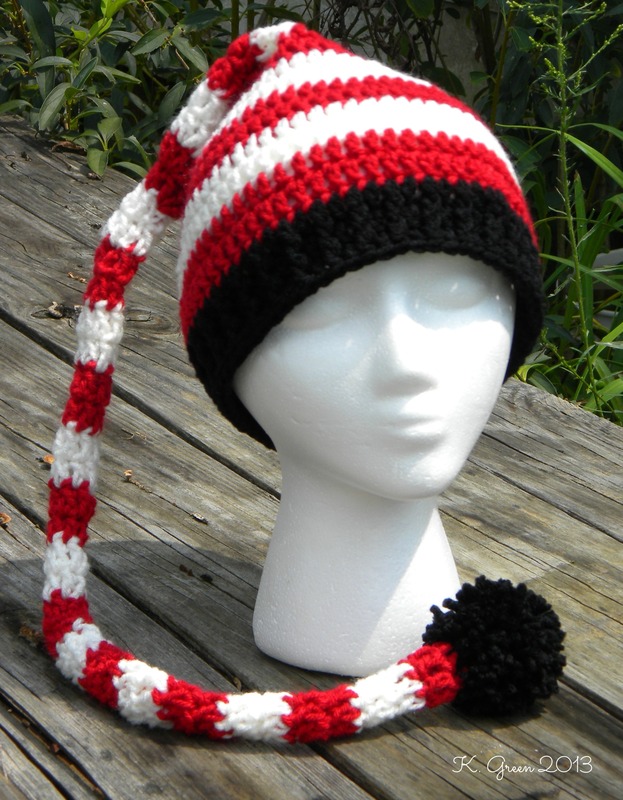 *NOTE: For a striped hat, change colors every odd numbered row. 33: Ch 2, dc 9 evenly around, join at the top of the first dc. 34: Ch 2, 2 dc in each dc around, join at the top of the first dc. 35: Ch 2, inc 4 evenly around, join at the top of the first dc. 36: Ch 2, inc 3 evenly around, join at the top of the first dc. 37-38: Ch 2, inc 2 evenly around, join at the top of the first dc. 39-41: Ch 2, inc 4 evenly around, join at the top of the first dc. 42-44: Ch 2, inc 6 evenly around, join at the top of the first dc. 45: Ch 2, inc 4 evenly around, join at the top of the first dc. 46: Ch 2, inc 2 evenly around, join at the top of the first dc. 47-50: Ch 2, dc in each st around, join at the top of the first dc. 52: Ch 2, dec 2 stitches evenly around, join at the top of the first dc. 52-53: Ch 2, *fpdc, dc. Repeat from * around, join at the top of the first dc. Make a pom pom and attach to the end of the long tail. This pattern is free for use to make hats for you to to sell. Please reference this pattern link if you list hats online. I finally got the sewing machine moved in to my craft room (yay!) and wanted a quick project to make to celebrate. 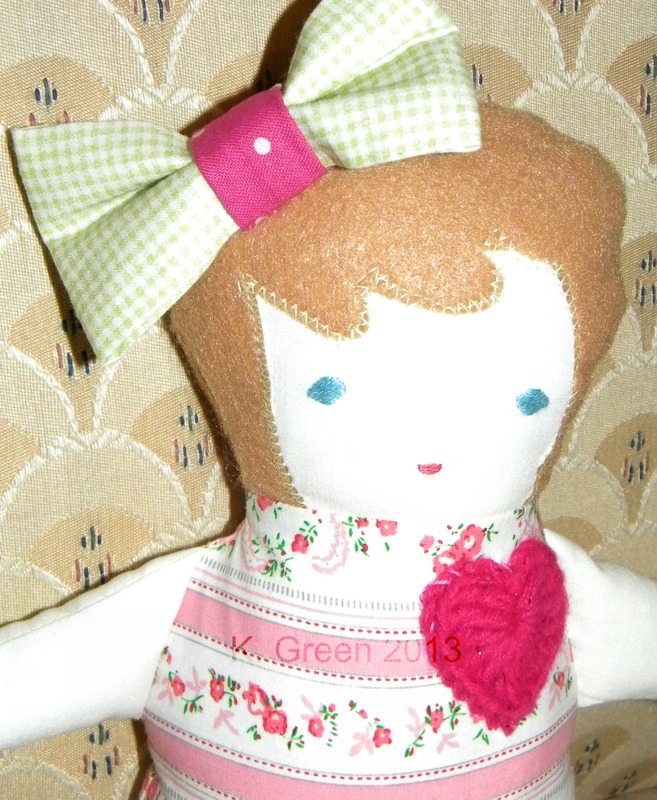 I found this adorable fabric softie doll from Little Green Notebook‘s blog, which she based on a pattern on Martha Stewart‘s website. The pattern needs to be printed at least 150% of the original size to be a good size doll. My printer would only print a portion of the pattern, which was the head and a portion of the body. I used that portion to redraw the arms, legs, and hair by hand. It wasn’t difficult and saved a trip to the printer/copier store. I followed the tutorial listed on Martha’s website, then made a fabric hair bow and a crochet heart to embellish her. For the fabric bow, I used the basic concept of this pattern from Simply Homemade except I reduced the rectangular fabric cut to 8″ by 5″ to make a slightly smaller bow. It was a very easy and simple bow to make. I may make another one in the full-size version for our little girl and attach it to a clip or headband to match her baby doll’s hair bow. For the crochet heart, I used the hot pink WW yarn and the 3.5 mm crochet hook. You can use a size or two larger hook if you wish to make the heart a little larger. 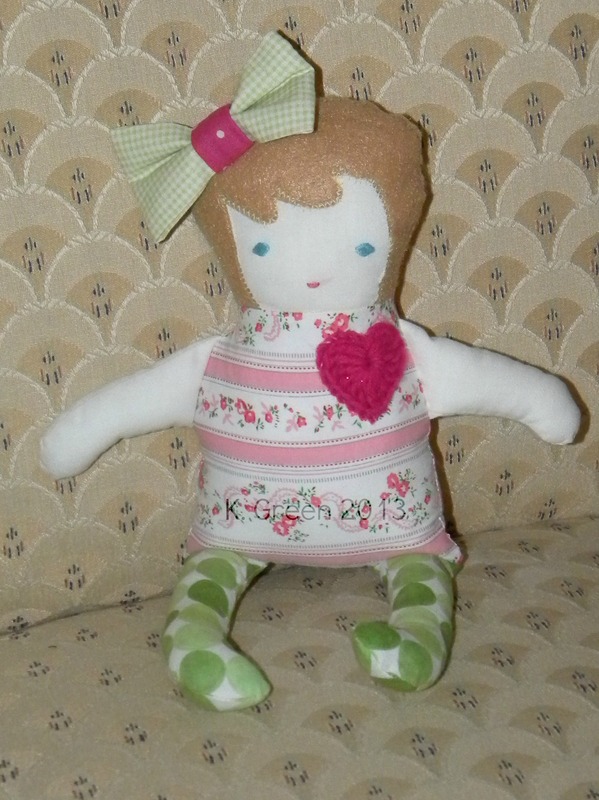 I didn’t want the heart on the softie to be too much on the striped floral print fabric for her body. Basic Crochet Heart Pattern: This is a pattern I found a while back and it does not have an author to credit. It’s a pretty basic design and has been around for next to forever as far as I can tell. Working into a Magic Circle, Ch 2. Into the Magic Circle work 4 dc, 1 trb, 4 dc, ch 2, sl st. Do not join. Tuck the tail into the center of the magic circle and pull tight to close the circle. If you can’t crochet, you can knit a heart or cut a heart from felt and hand stitch it to your softie doll. There are several more applique ideas to add to your softie available, including first initial, strawberries, cherries, puppy dogs… you name it. Just search for freebies online. For her embroidered face, I used DMC embroidery thread in a light pink and a light blue. You’ll only need a little bit, so you can also use sewing thread or even paint on her face. I didn’t use any paint to do a blush on her cheeks as pictured on other similar softie dolls, but you can add blush to your doll easy with a touch of peach or pink paint. Stitching felt onto fabric can be a real bear when using a sewing machine. I used a basting stitch to tack it down around the edges of the face and around the hair line before doing a basic zig-zag stitch at the hair line. You can leave it just basted on, use a decorative stitch on your machine, or hand stitch the hair applique to the face.